This Colorful Curvy Play Tent is very attractive for its special curvy sewing line. It has 4 different color combination on 4 sides panel which will catch your little ones eyes at first sight. Includes a mesh window for fun in the sun and for parents to check up on their children. Includes a tunnel door so you can create TENT CITIES with our other play tents. Please Note this is intended for play. DIMENSIONS: Length- 4ft /48" ● Width- 4ft /48" ● Height- 3ft 6in / 42" ●DIMENSIONS ROLLED-UP: 17.5X4X4" WEIGHT● 1.8 LBS 100% SAFE FOR KIDS! BEST CUSTOMER SERVICE GUARANTEED! 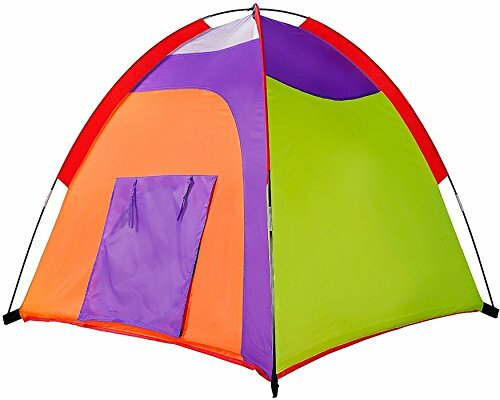 HIGHLIGHTS● This Vibrant Multi-Colored Dome Tent is suitable for 2-3 kids who have a very creative imagination! STRONGER/UPGRADED Fiber Glass Poles for support. Children can play all day in this light portable play tent indoors and out. Alvantor is a registered trademark. COLORFUL CURVY DESIGN● This Colorful Curvy Play Tent is very attractive for its special curvy sewing line. It has 4 different color combination on 4 sides panel which will catch your little ones eyes at first sight. Includes a mesh window for fun in the sun and for parents to check up on their children. Includes a tunnel door so you can create TENT CITIES with our other play tents. PLEASE NOTE THIS IS INTENDED FOR PLAY. EASY SET-UP & FOLD DOWN● Setting up this Play Tent is a fast and easy process that does not take longer than a few minutes. The unique folding capability of this tent allows it to be packed up in into a small portable carry bag. HIGH QUALITY● 100% safe, precise sewing, air flow, super soft material. NEW fiberglass tent poles - WE HAVE READ THE REVIEWS AND UPGRADED!! Smooth material for easy clean up with a wet cloth. If you have any questions about this product by Alvantor, contact us by completing and submitting the form below. If you are looking for a specif part number, please include it with your message.